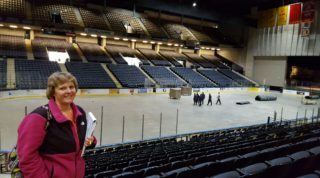 On a gray day in early December, a small crew of folk-dancing organizers from Philadelphia was hard at work inspecting the nooks and crannies of the Royal Farms Arena in Baltimore, thoughtfully jotting sketches in their notepads, counting seats and wheelchair spaces, and talking with arena management. All around, staff members were busy setting up for an indoor soccer game. All business, the folk-dancing group’s leader stood in one goal, pulled out her stopwatch, and proceeded to polka past the forklifts and rolls of astroturf, timing how long it would take an ordinary folk-dance troupe to get from one end of the arena to the other. Eventually the representatives from the lighting company arrived, and the dancers headed to the center of the floor to greet them. Astrīda Liziņa has danced in more Latvian song and dance festivals than she can recall. Her first was Cleveland 1973, where she performed as a member of the children’s group Ņudžersijas Zaglītis. She continued dancing with Ņudžersijas Dzintars in high school and Montreālas Ačkups in college. After school, Liziņa moved to Philadelphia, where she began teaching Latvian language and folk dancing at the local Latvian school and leading children’s dance group Filadelfijas Dzirkstele. Under her 26 years of leadership, Dzirkstele has expanded to include three generations of dancers; the original children grew up and continued dancing, and the children’s parents, wanting to join in on the fun, formed a senior branch of the troupe. In addition to her lifetime of dance experience and quarter-century-plus of dance leadership, Liziņa is no stranger to large-scale logistics, having run New York’s Latvian children’s summer camp Katskiļi for a full decade in the 1990s. When Marisa Gudrā, the future XIV Latvian Song and Dance Festival organizing committee chair, first floated the idea of hosting a festival on the East Coast, the committee knew the idea would be a non-starter without three difficult-to-find yet crucial elements: a city with available and appropriate venues (which we have already covered in this series), a music director (coming up in a future instalment), and a folk-dancing director. Liziņa, with her extensive dance leadership, her deep East Coast roots, and her proven organizational skills, was the natural choice for the latter role. But she says she was surprised by the proposal, and spent a full month considering whether she had the time and skills necessary for the task. Having participated in festivals as a troupe leader for decades, she was already aware of what a titanic job this would be, and recognized that her experience leading three troupes in front of a couple hundred people at a Jāņi summer solstice celebration was different from leading three dozen troupes in front of thousands of people at dziesmu svētki. Support and encouragement came from two sources. First, recognizing that such an undertaking would realistically become a full family project, Liziņa called a family meeting, where her husband (and de facto co-organizer) Andrejs and their three children overwhelmingly agreed that the project was worth taking on. Second, she turned to the masters: previous festival folk-dancing show leaders and renowned choreographers Māra Simpsone and Selga Apse (Hamilton) and Iveta Asons (Indianapolis). These folk-dancing icons were immediately reassuring, offering and continuing to provide counsel for the duration of preparations. Even with the support of her family and advisors, Liziņa recognized that no one person could manage a project of this magnitude, so her first step upon accepting the job was to recruit a full team. For this she turned to the current and former members and supporters of Dzirkstele. 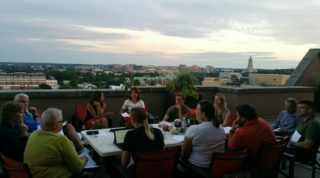 In the spring of 2016 she called an all-hands meeting, and Philadelphia Latvian society responded with enthusiasm; 32 eager people attended. Volunteers signed up for various tasks and committees (though after prodding, Liziņa admits that she’d already mapped out who should take each task), and they were off! Philadelphia dāmu komiteja leader Baiba Akkerman, who, along with Ieva Bundža, has been tasked with providing lunch to several hundred hungry dancers at this summer’s festival, says she was surprised at the first meeting by just how much goes into putting on a show – and how much it all costs. From lighting and sound design to large-scale decorating, catering and the logistics of moving hundreds of dancers around the arena, she had never realized, having danced in previous festivals, just how much was going on behind the scenes and how each element eats up time and resources. Even her somewhat straightforward task of finding caterers has been complicated by factors such as arena requirements and a dearth of caterers willing to work over the holiday weekend. Similar complications exist even for something like dance selection. It’s not just Liziņa picking her personal favorites and calling it a day. Instead, a committee has been assembled of dancers and former dancers of various ages. First, each member went out on his or her own and brainstormed a list of favorites. They then came together and assembled a master list. Then the toughest job began: picking which beloved dances to remove from the very long list. An early and relatively easy step was to avoid repetition and cut (almost) every dance performed in the past couple North American festivals. Another major consideration was whether there were enough fun dances for the increasing number of smaller groups, which are often left out of the more popular eight-pair dances. The committee also wanted to ensure there were options for various dance abilities, ranging from simple dances for older or less experienced troupes to fast, complicated dances for more advanced groups. Finally, the committee strove to evenly fill each segment of the program, titled Dejā uz Latvijas simtgadi (“Dancing to Latvia’s Centennial”) and divided into three historical sections: dance before exile, dance during exile, and dance after exile. Once the committee had come up with a solid list, Liziņa sent it to previous folk-dance program leaders for their expert opinion, resulting in a few more tweaks. But Liziņa still faced a summer’s worth of tasks before anything could be finalized: informing choreographers that their dances had been selected, and tracking down all the apraksti (written instructions), videos, and audio recordings necessary for troupe leaders to adequately instruct their dancers. Particular attention was paid to finding audio recordings good enough to use during the actual performance, as the idea of using live music was quickly scrapped for budget considerations (for which I as a dancer am thankful, since live music can often differ in pacing and arrangement from the music used to learn the dances). The deadline for troupe sign-up came in the fall and provided a first reliable gauge of interest. An initial questionnaire in the spring had yielded positive results, but with this new official response, any lingering fears about diminished dancer counts disappeared. Liziņa had initially hoped for 450 dancers; instead, 650 (spread across 35 troupes) registered. Why the surge? Good news: it has come largely thanks to the next generation of folk dancers. Children will make up one third of all performers in this summer’s show, a welcome sign for the future of Latvian dance, considering that previous years have shown a decrease in child participation. For one, GVV (summer high school Gaŗezers) will be in attendance, bringing with it nearly a hundred young dancers – and in many cases inspiring younger siblings to make the trek with their respective children’s troupes. There is also a single troupe coming from Latvia with 85 child and teen dancers. But even without the infusion of young dancers from these two sources, the participant count happily exceeds expectations. A lot can be gleaned about the changing nature of Latvian dance from the demographics of the participating troupes. In some ways this folk-dancing performance will be the same as it has been in festivals past, but in other ways it is changing. Baltimore will continue a recent festival trend of welcoming participants from around the globe, with five troupes arriving from Latvia and two from Ireland. Stateside, areas like Rochester and New Jersey are seeing the rebirth of dormant troupes, while newer groups such as Denver’s Virpulītis are thriving. Several chapters, new and old, are being run by first-time leaders, many of whom have arrived from Latvia and thus have little to no previous experience with an American festival. And a few long-standing, established troupes are run by non–Latvian speakers. All of these factors signal a rebirth and continuing growth for the North American Latvian dance scene, but they also require clear communication by Liziņa and her crew; gone are the days of saying, “Just do it like we always do,” as plenty of new folks are inspired to enter the scene. Five months before the festival, what is still on the plate for the capable team from Philly? Plenty. Dāmu komitejas from across the continent have been chipping in to help cover the costs of feeding the dancers. Following the December walk-through, the decorating committee started planning under the leadership of Ņujorkas Jumis dancer Andris Krūmkalns, who works on Broadway sets for a living. For them the focus will be on efficiency: giant space, limited budget – good luck. And sound and lighting design continues apace, requiring the careful planning of set pieces, lights, and sound equipment; elaborate calculations regarding the length and number of trusses, the weight of the lights, equipment, and set pieces, and the size of the motor needed to lift that weight; as well as a full team of paid staff. After several meetings, estimates, and evaluations by friends in the lighting business in other cities, an overall plan (and acceptable quote) has finally been hashed out, but details are still being finalized. For Liziņa, the next big step is designing floor plans – a much more involved task than it might seem. For each dance, Liziņa has to check which troupes are dancing, where they’re coming from, and where they need to go. A troupe can’t dance off through Gate A and immediately dance on through Gate B. It takes meticulous planning and attention to detail. Thankfully, Liziņa is up to the challenge, as you will see for yourself this summer in Baltimore. Actually, Denveras Virpulītis isn’t really a “newer group.” It started back in 1957 and participated in its first song festival in 1968 in Cleveland. Labdien! Vai jau zināms, kādi deju kolektīvi ir pieteikušies uz svētkiem “XIV Latvijas-Amerikas Dziesmu un deju svētki”, kas notiks Baltimore, Maryland, no 29. jūnija līdz 3. jūlijam, 2017 ?